4.0 out of 5 based on 33 bloggers and 5 commenters. 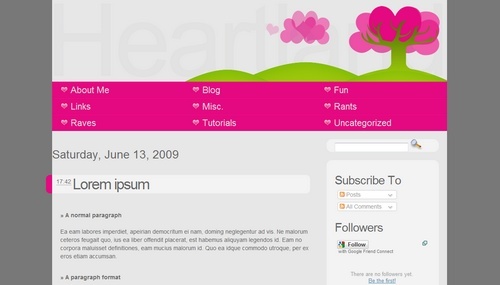 Heartland is a free blogger template adapted from WordPress with 2 columns, right sidebar, web 2.0 design, rounded corners, girly looking and vectorial elements. Help me please! I love this template and I want to use to my blog.